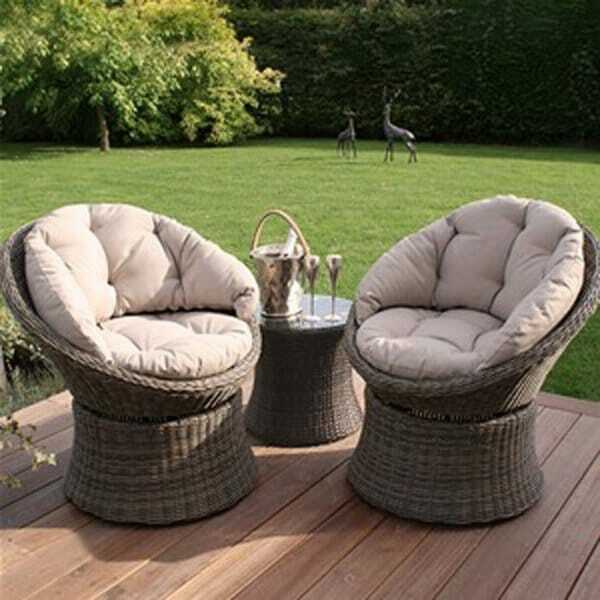 Maze Rattan Winchester 3pc Swivel Lounge Set: The Maze Rattan Winchester 3pc Swivel Lounge Set is a quirky outdoor lounge set made up of two swivelling 'bucket' style chairs and small coffee/side table. If you want to relax but still like to move around, these swivel seats perfect for you. The thick padded cushion offers you great comfort and the easy to move seats means you can alter your seating by moving your feet. The coffee table is the idea height for placing your coffee and drinks on. The whole set is made from synthetic rattan which is sturdier and more durable than traditional rattan furniture. There's no concern of this rattan fading as it is UV protected and will never split, so you can really be sure about leaving this set outside all year round. It is recommended to store the cushions indoors over extended periods of wet weather.